PBC Brasil Onward and Upward! Deans Ken and Glenda Malmin travel to Brazil to conduct a live class with online students from 15 different cities. Students unable to travel were able to stream the live lessons. This summer, Portland Bible College wrapped up its first online semester in Portuguese. With over 80 students from 15 different churches in Brazil participating, PBC Online was a huge success. PBC offered Life of Christ by Glenda Malmin and Old Testament Survey by Lanny Hubbard. The PBC Online Team could not do it without the vision and dedication of it’s Portuguese speaking partners in Brazil. The entire online classroom and course materials were translated into Portuguese by Leandro Martins, Lucas DeSousa, and Leticia DeSousa Henriques, with the help of many others in Brazil who spent hundreds of hours processing applications, answering questions, and registering students. 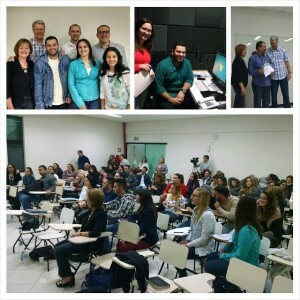 Deans Ken and Glenda Malmin traveled all the way to Brazil this summer in order to meet with all of the PBC Students. And, they were so impressed by all the pastors and leaders that dedicated so much time and energy to their PBC coursework. The PBC Team in Portland feels a real connection to all of our students in Brazil. The second term is well under way and has already grown to 110 students taking Basic Doctrine and New Testament Survey. PBC is so excited about the future of the PBC Brasil Program and love all of our Brazilian Students!